Whites in South Africa are now having their farms and land stolen from them by the racist South African government without compensation. White South Africans of all ages are being horrifically massacred every day. Black South African politician Julius Malema brazenly says that they are not calling for the killing of all whites in South Africa “yet.” These crimes against White South Africans cannot be tolerated and we have a moral duty to speak out against them! Please call or write to President Trump immediately about this matter. Fox News recently did a story about this. Trump made a non-committal tweet about the issue. That isn’t enough! 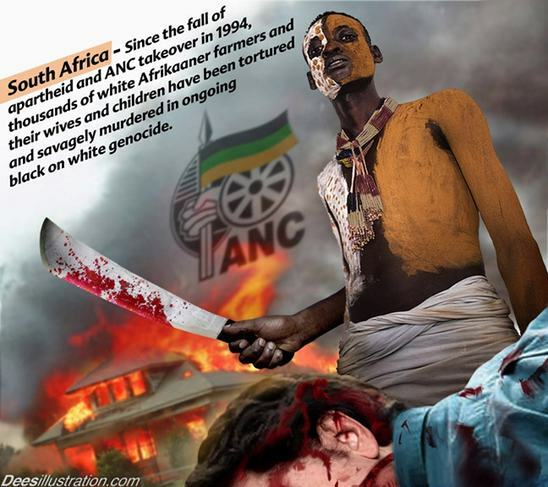 The South African government must be SANCTIONED for its criminal, racist, and genocidal policies! Additionally, White South Africans must be allowed to come to the US as political refugees for their own safety! This is an emergency situation. Please be respectful, polite, and stay on point in your calls, e-mails or letters. President Trump must do something about the criminal genocidal policies against Whites in South Africa! We ask that he apply punitive sanctions against the government of South Africa immediately. We ask that he immediately issue an executive order recognizing South African Whites fleeing persecution as political refugees, and giving them the right to stay in the US, because of the emergency situation now taking place. South African whites are high-skilled, educated, and are hard workers, who would contribute to America in a positive way! They cannot be compared to illegal immigrants from Mexico who violated US law to enter this country. We strongly support the wall, and the deportation of all aliens from the third world, at the same time. The situation of Whites in South Africa is entirely different. 1. It is the morally right thing to do. It is an urgent humanitarian crisis that cannot wait! 2. It will not cost him any support among people who did vote for him or who might vote for him. It will only energize his core support base. 3. It will piss off his personal enemies. The media attacks him every single day. This is a way to give them a good slap across the face. Don’t they deserve one? Please re-blog this message and circulate it by e-mail. We just found out that Michael Savage has a petition urging Trump to grant “Priority to White South African Farmers.” The petition doesn’t mention political refugee status, or sanctions on the SA government. We still would like to urge everyone to sign it anyway. He has talked with President Trump personally in the past, and we need to do everything possible to influence Trump on this issue. We have heard that the land theft has stopped for now, however it will likely resume at some point.